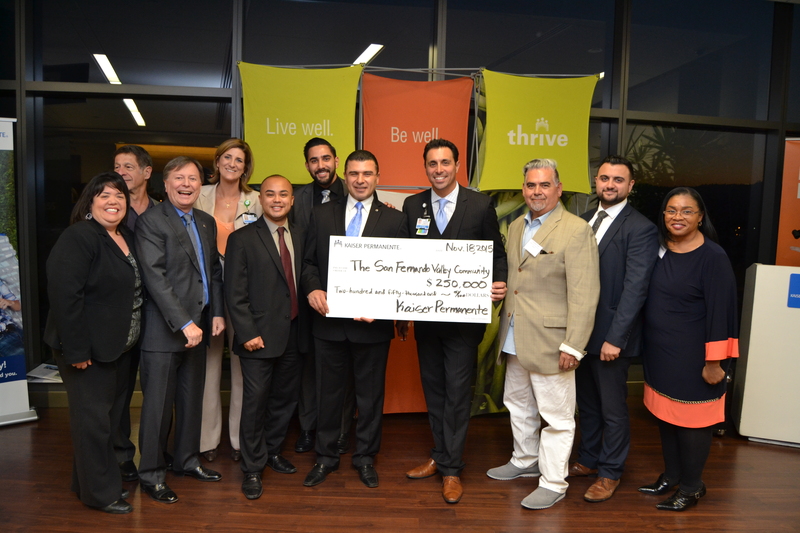 PANORAMA CITY, Calif., November 18, 2015 — In the spirit of the season of giving, Kaiser Permanente Panorama City Medical Center awarded $250,000 in community benefit grant funding to 27 well-deserving San Fernando Valley nonprofit organizations committed to improving health locally and meeting critical needs in the community. The awards celebration took place at the open house of the North Hollywood Medical Offices in the company of local community leaders, members of the public, and Panorama City Medical Center leadership. Boys & Girls Club of San Fernando Valley received funding to support a community garden, cooking class, healthy snacks, and after school fitness program for low income children in Pacoima. Casa Esperanza received funding to conduct a physical activity and nutrition program in a safe environment for low-income, underserved Latino families in the Blythe Street area in the San Fernando Valley. The Center for Individual and Family Counseling received funding to provide low-income at-risk youth and their families with school-based mental health counseling at five northeast San Fernando Valley schools. Center for Living and Learning to provide vulnerable individuals with barriers to accessing healthcare and health insurance with navigation and case management services connecting them to partnering agencies. Community Integration Services, Inc to provide case management, health education, and close monitoring of medi-cal, medicare eligible Latino seniors with diabetes in the East San Fernando Valley. El Centro de Amistad received funding to provide undocumented, uninsured Latino adults with mental health counseling services in the San Fernando Valley while linking them to long-term support. El Nido Family Centers received funding to support their Teen Parent Family Services program increasing access to healthcare, wellness education, health promotion and disease prevention for disadvantaged pregnant/parenting teens and their babies in the San Fernando Valley. Hands for Hope received funding to support a health and wellness after-school program for low-income children in North Hollywood. Haven Hills received funding to provide culturally and linguistically appropriate counseling, healthcare navigation, and case management at their domestic violence Crisis Shelter. Hope of the Valley Rescue Mission received funding to support case management and navigation services for homeless individuals at their Recuperative Care Center in the San Fernando Valley. Kids Community Clinic of Burbank received funding to provide free dental screenings and preventive treatments at San Fernando Valley schools thus linking low income, uninsured children to dental care. LA Family Housing received funding for case management and navigation services linking their homeless clients to mental, dental, and substance abuse resources to ensure their success in permanent housing. Meeting Each Need with Dignity (MEND) received funding to support their chronic disease management program for low-income, uninsured Latino clients in the East San Fernando Valley. New Directions for Youth received funding to support Health Watch, an obesity prevention program promoting physical fitness, healthy lifestyles and good nutrition for low-income at-risk youth who are disproportionately affected by childhood obesity. Northeast Valley Health Corporation received funding to support increased access to medical, dental, and behavioral health for students at the San Fernando High School Teen Health Center. Penny Lane Centers received funding to provide at risk young girls receiving services through their mental health clinic in the San Fernando Valley with educational workshops on teen pregnancy and domestic violence prevention along with referrals to prenatal care as needed. San Fernando Community Health Center received funding to partner with the City of San Fernando and California State University Northridge kinesiology students to support nutrition and cooking classes and a physical activity program for low income fathers and children in the City of San Fernando. Socrates Opportunity Scholarship Foundation (SOS Mentor) received funding to support the Imagine HEALTH program, a mentoring program that promotes healthy eating and active living while training high school students to then mentor middle school students while incorporating advocacy efforts for a healthy school environment in the San Fernando Valley. Students Run LA received funding to support a training conference for the volunteer SRLA teacher/leaders with information on nutrition, health, and safe training practices to help at risk youth train to run the Los Angeles Marathon. The Teen Project received funding to support mental health services, case management, and supportive housing for at-risk, homeless young women in the San Fernando Valley. Tierra del Sol Foundation received funding to provide healthy eating active living nutrition and physical fitness programming to developmentally disabled adults. Valley Care Community Consortium received funding to support a faith-based approach to addressing nutrition education and obesity prevention at three churches in the San Fernando Valley incorporating policy and environmental change approaches. Valley Community Healthcare received funding to provide expand dental health services for underserved, uninsured patients in the San Fernando Valley. The Village Family Services received funding to provide mental health, peer support, and life-skills support services to homeless, at-risk youth at their Transition Age Youth (TAY) Drop-In Center co-located at Valley Community Healthcare Teen Clinic. Valley Family Center received funding to support the Culturally Competent Counseling Program which provides individual, couple, and family therapy to low income children and adults in the San Fernando Valley. YMCA – East & Mid Valley Family received funding to support Active Kids/Active Families, a healthy eating active living program modeled after KP Kids, to low income children and families with direct referrals from Title I LAUSD school nurses. For more Kaiser Permanente Community Benefit programs, visit: http://community.kp.org and follow @KPCommBenefit on Twitter. Kaiser Permanente Panorama City serves more than 200,000 members in the East San Fernando and Santa Clarita valleys. The care we provide to members and patients is focused on total health and is guided by each patient’s personal physician, specialists, and team of caregivers. For more information, go to: kp.org/panoramacity and follow us on Twitter @KPPanoramaCity. Kaiser Permanente is committed to helping shape the future of health care. We are recognized as one of America’s leading health care providers and not-for-profit health plans. Founded in 1945, our mission is to provide high quality, affordable health care services to improve the health of our members and the communities we serve. We currently serve more than 4 million members in Southern California. Care for members and patients is focused on their total health and guided by their personal physicians, specialists and team of caregivers. Our expert and caring medical teams are empowered and supported by industry-leading technology advances and tools for health promotion, disease prevention, state-of-the-art care delivery and world-class chronic disease management. Kaiser Permanente is dedicated to care innovations, clinical research, health education and the support of community health. For more information follow us on twitter; @KPSCALNews or go to: www.kp.org/share.